“In many ways, I don’t want to go back to the Tour ever again.I don’t need to: I’ll always have winning it in 2012.I don’t know if the desire is going to be there…If I were to go back to the Tour and my heart was not in it, or I hadn’t done the work, I’d be in big trouble…If I can’t do it 110 percent to win, I’d rather not be there. Sir Bradley Marc Wiggins, CBE (Commander of the Most Excellent Order of the British Empire), known as “Wiggo”, is a breath of fresh air for cycling. A true family man, albeit one whose father was missing from his life like another much more arrogant former Tour winner, Wiggo wants simple life without the trappings of the fame that comes with his multiple Olympic and World Championship gold medals and now a Tour win. He just wants to go home to Cath, the woman he has known since age 15, and his two children Ben and Isabella. He is a very private man, one who shies away from the limelight and certainly has no need for a phalanx of bodyguards. He has written a fine book in the first person covering his life, progress in cycling and focusing on 2012, his “golden year”. 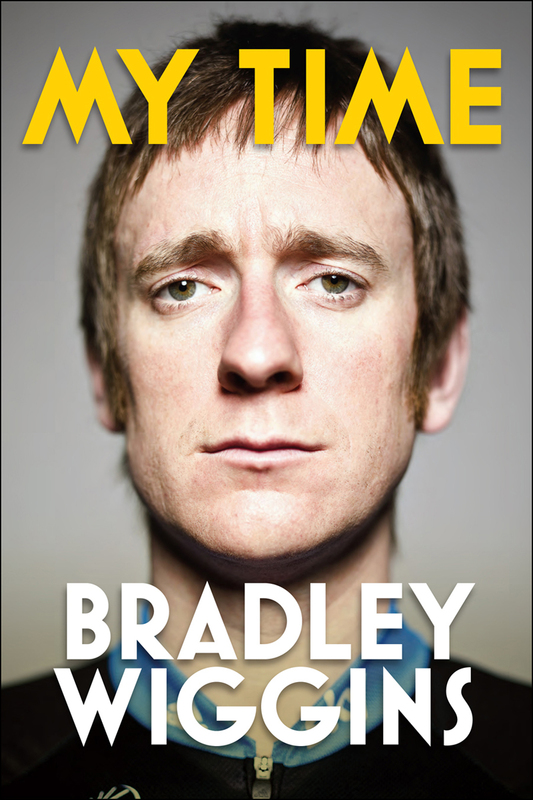 Together with noted cycling journalist William Fotheringham, “My Time” covers a lot of ground with a personal touch. In 2012 Wiggo won Paris-Nice, the Tour of Romandie, the Critérium du Dauphiné, the Tour de France, and the gold medal in the Olympic Time Trial in London nine days after the finish of the Tour. He has won six other Olympic medals, including three golds, on the track, and ten World Championship medals, including six gold. He was instrumental in helping Mark Cavendish win the World Championship Road Race in 2011. And he states he always wanted to lead the Sky leadout train down the Champs-Elysées in the yellow jersey, leading Cav in the World Champion rainbow stripes jersey. He took the next to last pull, dropping off teammates Edvald Boasson Hagen and Cavendish at 700 meters to go. Cav won going away, in his World champion rainbow jersey. Wiggo is one of the new generation of riders that is outspokenly anti-doping. To my eye, watching the races over the last 30+ years, as the peloton has become cleaner over the last few years the racing has gotten even better. The climbing times may be slower, but there are more protagonists in the mix. Wiggo gave a memorable response to a direct question comparing Sky’s performances to US Postal’s with Lance Armstrong during the Tour’s rest day press conference, and then got up and stalked away. He devotes an entire chapter to the subject, addressing former dopers, both confessed and caught, and why he won’t dope: He feels lucky that he ended up in Manchester riding track for Great Britain rather than in the pro peloton on the Continent in the late 1990’s and early 2000’s. He also is grateful for feeling like now he is on a level playing field without doping, and that the new generation of riders coming into the pro ranks will not have to face that question: do I have to dope to be successful? It is an interesting chapter to read. A historian of cycling, he was also a boy who had posters of Miguel Indurain, Robert Millar and Sean Kelly on his wall rather than the soccer stars most of his friends had. It is plainly hard for him to think of himself as their equal, let alone thinking that he belongs in the company of riders like Merkcx, Indurain, and Hinault. One of his favorite memories from the 2012 Tour is receiving a red scarf during a TV interview, a scarf along with a recorded message from Indurain. The scarf was from the Pamplona bull run, a private model unavailable for sale, with he Indurain family emblem on it along with Indurain signature “To my friend Bradley”. Wiggo seems truly touched to be recognized by one of his childhood idols. The first person voice with which “My Time” is written really shows the depth of respect held for for those champions before him. A bonus is the excellent introduction by Robert Millar, who touches on the Tour as theatre. He reminds us that the French refer to each stage as un étape, which when you translate it as intended means “part of a journey”. 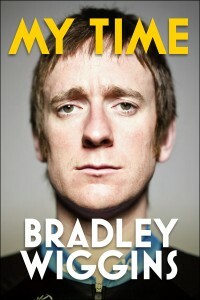 He reminds us that life itself is a journey of trials and tribulations, and that Wiggo’s life was such a journey. From being abandoned by his father, early success on the track, to a bout of depression and drinking after the 2004 Olympics while trying to deal with the fame from winning gold medals. From a very rough 2011 season to a golden year in 2012. It’s a good summer read, one worth picking up.